Glen Rutland is a consummate professional aviator of over 40 years' experience. He has accumulated over 25,000 hours of flight time, having spent most of his time in professional aviation in the Part 121 environment. Following a very successful airline career, Glen retired as a Captain flying the Boeing 747 on international operations for a major international carrier. After the airlines, Glen reentered the aviation world as a corporate pilot. Glen spent several years as a Captain for a major fractional ownership operator, and has flown Captain on business jets ranging from the Cessna Citation to the Bombardier Challenger. 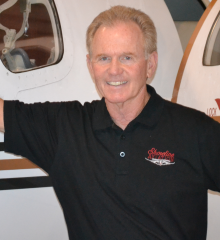 Not content with retirement, Glen and his partners have built Shoreline Aviation Services, LLC. Glen brings a wealth of experience and knowledge to Shoreline and its customers, offering them a seasoned aviator's insight and expertise. A founding partner of Shoreline Aviation Services, he serves as the Chief Executive Officer of Shoreline Aviation Services, an agent in the insurance division, and still serves Shoreline clients from the flight deck!